No one who made or encountered the Nokia 3310 of old years back would have a bad review, be it the battery life, being rugged, physically strong and easy to maintain. If I am not wrong, when released into the Nigerian market 15 years ago, half the population of Nigerian mobile phone users as at 2002-2003 were owners of this iconic gadget. 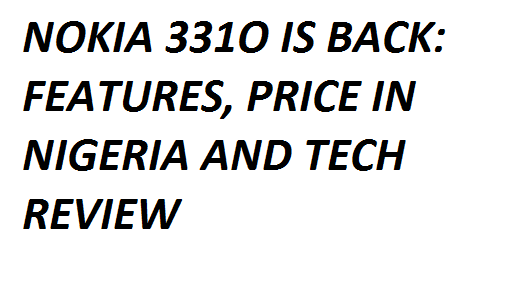 Just recently at the MWC 2017, Nokia under HMD announced the rebirth of the nokia 3310 with amazing new features. The rebranded Nokia 3310 is in no way different from the one released 17 years ago, though a whole lot of modification and edification has been done to meet the present day needs of nokia 331o freaks. The gadget now looks finer and slimmer compared to its older version, the screen resolution has been increased to 2.4" and its coming with a coloured screen. the new Nokia 3310 weighs about 79.6 grams and its 12.8 millimeters thick. Now this is a whole lot of modification carried out in terms of size and weight. Accordingly, it now comes with different colours and the ever grey colours didn't miss out. Remember the large blue button, 'C' key and the arrow buttons on the old Nokia 3310? well, they've all been ousted from the resurrected version. The replacements are a box-like central keyboard, with two buttons on each side for 'call and 'end call'. HMD Global, the company that now has ownership of the Nokia brand says the Gadget is designed to be used a 'fun' mobile. The new gadgets use micro-SIM cards as this will make transition simpler from other smart easier for Nokia 3310 fans. No one knows if the gadget will be waterproof like latest makes from Apple and Samsung, but I sure know is that it will be durable and reliable. The device comes with a 2-megapix camera and an LED flash. The battery life has also been improved and it comes with an internet connection of 2.5G. No matter the modifications carried out, 'SNAKE XENZIA' can never be ditched from this device. So yes, you still have it intact! The phone will sell at a retail price of €49. Whatever the case maybe, I just cant wait to see and make use of this new device. Did you enjoy this review? Please let us know at the comments box.